I believe a yogin is one who is skilled in action. With a mind gaining noticeable clarity day-by-hard-working-day. This clarity can only come if the mind is not disturbed and that, in itself, implies a still mind. If you practice yoga, you must have constant proof that you are moving in that direction. There must be tangible evidence within yourself and within your relationships. There must be a strengthening of character, a diminishing of doubt and a growing certitude that you are beginning to align with your dharma, your path as it is within the framework of the whole fabric that is this living organism called “uni-verse”. A singular song of pure intelligence, pure love and pure awareness. By pure I mean unconditioned. And unconditional. A yogin acknowledges the ties that bind us to each other and that the real ties are to this higher principle of love, intelligence and understandings. There is a lot that separates us from this yoga. But they are all distractions. They are of an ever changing reality that is loaded with doubt, arrogance, division and fear. A yogin feels great sorrow for their own part in this. A part that arises just from being born into this reality. The greatest goal of an aspirant is to achieve “kaivalya” a state in which there is neither this nor that. Aloneness means not even you as object exist and then there is nothing to condition your awareness and nothing to not love, not understand, not be at peace with. If there is no objective you, then there is no need for a rebirth. The work is done. But what about for the rest of us? Who may practice yoga for better health, for a better way to live our lives here and now? For healing our traumas and licking our wounds. And then to enter into the fray of the battle once again. Determined to master the art of living this life. And for creating the karma that gives us a superior life next time around, if there is another next time around? It is from this place of teaching this yoga, which here intersects Ayurveda, the science of life, that I dedicate this year of 2016. What it means to live such that the sleep at night is nourishing and not disturbed with heaviness. What it means to eat a food that brings you delight, is digested with joy and becomes the fuel that nourishes you. What it means to practice daily living in such a way that each morning is a new life line and every night is a review and affirmation of that progress that yoga promises. What it means to practice that yoga and how to bring that yoga home; home to your own personal space. What it means to find that the strength of the mind depends on the strength of your willpower, your clarity and your hard earned wisdom. And that it is authentic to say no when the sense organs crave that which weakens you. In 2016, I shall try and curtail my travel so I can write my book. If I am not coming to your town once again, reach out and we will find a way to meet! And in October this year, for the first time the India Retreat will be dedicated to studying the Yoga Sutra of Patanjali. As I work on the final aspects of putting this together, please if you wish, save your October to travel with me to India and study this miraculous text in its original environment. Satvajaya Cikitsa at the NAMA Conference: April 16th. Sattvajaya punar ahitebhyo arthebhyo manonigraha: Regarding techniques for controlling or restraining the mind from desires for unwholesome objects, to be achieved by increasing sattva. This is the solitary reference to sattvajaya in the Caraka Samhita, but it magnificently explains what all yogin know: Pratyahara is the single greatest tool for controlling the sensory mind. Since ahara means food, Ayurveda teaches us to identify the food for each of the 11 senses and also how to control our relationship to them. The mind is functional in four ways. The senses are the key in this approach. It is the senses that are most in need of healing in our overly sensory world today. We will explore the role of Ayurveda in treating psychological trauma and addictions along with the sister science of yoga. Arun Deva is a yogin, practitioner of Ayurvedic medicines, yoga cikitsa provider and a world traveler, looking for the Buddha in every face he sees. He has presented on Ayurveda worldwide and also has been practicing Ayurveda at his clinic in L.A. since 2004. 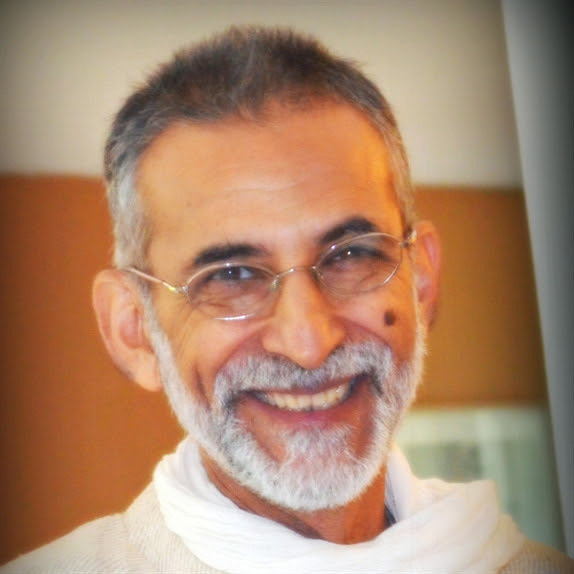 Arun has also lectured extensively on Ayurveda at conferences, is faculty at LMU, and chairs NAMA’s Ayurvedic Yoga Therapy Subcommittee. Find more information about Arun at www.yogarasayana.com. ONE: Since 2010 I have been working in a NAMA (National Ayurvedic Medical Association) Committee for creating Standards of Ayurvedic Yoga Therapy (AYT) as a separate Category. In 2013 I became Chair of this Committee. We now have an approved Scope Of Practice and preliminary Competencies. We are now working on Educational Guidelines. TWO: The next Project: Bhāvané Technique.This Emotional Rebalancing Practice combines the power of yoga and Ayurveda for emotional body therapeutics. We are in the experimental stage and if you are drawn to volunteer for a session (at a substantial savings) please reach out. This will be a thoroughly researched practice you can participate in. Already those who have experienced it have had extremely positive results. Email me at yogarasayana@gmail.com if you are interested. Include your health history and what you may be struggling with emotionally or even physically where you suspect an emotional causation. There is nothing more important and powerful than family. May we all become each others. This entry was posted in Articles, Ayurveda, yoga, yogarasayana by yogarasayana. Bookmark the permalink. A yogi/ayurvedic physician who travels the world teaching and learning.